Source:Tweet from @kleb79 about her relative. This is her Great Grandfather. 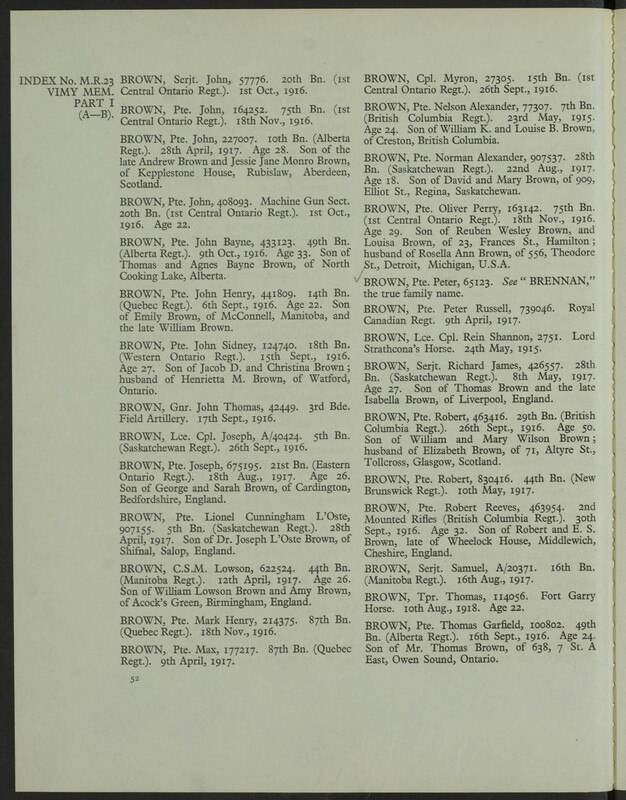 @CWGC Great Grandpa John Sidney Brown, CEF 18th Battalion, KIA Battle of the Somme – September 1916. Buried? The Battle of Courcellete makes not a mention on the date of the war diary entry, yet is was a major battle and shed the blood of Canadian soldiers such as Pte. Brown. 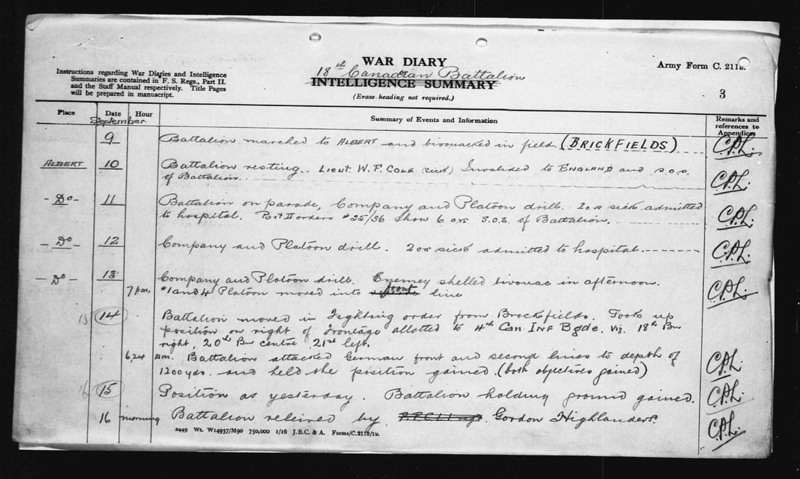 As the image below shows (see scan from the war diary later below) this battle, the men, and their actions of the 18th Battalion were not well represent by the diarist(s) of the war diary at this time. Small compensation for the Brown family and the other 1003 Canadian soldiers killed on this date. Of those 93, almost 10% were members of the 18th Battalion. John Sidney Brown, of Watford, Ontario has no known grave but for an inscription on the Vimy Memorial. The war diary of the 18th Battalion indicates that on the night of September 14th, 1916 there was an attack on the German lines with a 1200 yard penetration. The Battalion was located near Albert, France on the Somme battlefield at a location commonly referred to as “The Brickfields” The war diary makes no mention of the soldiers killed or wounded on this date and given the low number of pages and the brevity of the entries the person(s) responsible kept a very basic record of the action on one of the deadliest fronts in the Great War. Pte. Brown made out a will (see Service Record) on July 22nd, 1916 leaving “his property and effects” to his wife, Henrietta M. Brown. Sadly, the will took legal affect on the date of his death. I wonder what property and personal effects his war widow received? Detail of Albert, Somme. 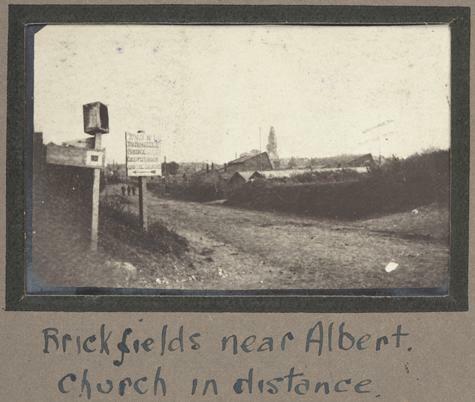 Note the label “Brickworks” to the north of town. Probable locale of the Brickfield. Son of Jacob D. and Christina Brown; husband of Henrietta M. Brown, of Watford, Ontario. John Sidney Brown ( Sid) was killed at the Battle of Courcelette when the 18 Bn attacked Sugar trench just out side the ruined town. Vern, Sids brother was in the same attack and they went over at the same time, Vern survived the war. There is a short letter to their mother published in the Watford Guide- Advocate of October 13, 1916. Sid was survived by his wife and two small daughters. Sids medals were lost since they were signed for by his wife in 1921. Sids name is seen on the Vimy Memoral since no trace of him was ever found. Vern, his brother searched for him at aid stations and around the battlefield hoping to find him alive but nothing was ever found of him after the morning of the 15 Sept, 1916. He was first listed as missing, then listed as killed in action a short time later. Official records list him KIA. “Killed in Action” This Soldier was killed by an enemy shell during the advance and capture of COURCELETTE. This is wonderful. Thank you very much. There is a misprint above. Brown was from Watford, Ontario not Waterford. Thank you for informing me. I will correct this.